penalty fare related fairness request, installment payment plan request. It is important to know that the submission of the request does not mean automatic exemption from paying the penalty fare payable at the time, neither does it mean deferred payment or an obligation for positive evaluation by BKK Zrt. Address: Budapest VII., Rumbach Sebestyén utca 19-21. For your kind information, since 1 April 2017 debt collection on behalf of BKK Zrt. has been carried out by the Budapest Municipal Debt Management Company (BÖK Kft. ), which is fully owned by BKK Zrt. based on assignment contract 1128/22666-2/2017/1024 of 27 March 2017. Postal address: BÖK Kft., 1550 Budapest, Pf. 208. Postal address: BKK Zrt. 1241 Budapest, Pf. 200. If you pay the penalty fare in cash on the spot, the amount to be paid decreases to HUF 8,000. The ticket inspector must give you a receipt for the on-the-spot payment. The on-the-spot penalty fare (HUF 8,000) can be settled retrospectively by cash or credit card payment within 2 working days after surcharging, at one of the dedicated BKK customer points listed under the General Information section above. You will receive an incoming payment document as proof of payment. 3. Presentation of the pass and cash or bankcard payment at one of the dedicated BKK customer points listed under the General Information section above. You will receive an incoming payment document as proof of payment. If the passenger is in possession of a pass and a matching ID (pass ID, student ID, personal photo ID, passport or card-format driving licence) or bicycle pass that was valid at the time of control (that is, it had been purchased before inspection), but it could not be presented, or if the passenger has a travel document for free travel but it was not presented at control, the customer can take care of penalty fare payment within 5 workdays from the issuance of the penalty fare by presenting the pass or travel document along with the matching photo ID and by paying the appropriate fee at one of the dedicated BKK customer points listed under the General Information section above. The fee is 1,000 HUF for annual, semester and quarterly passes and travel documents for free travel while it is 2,000 HUF for all other types of passes. This option is available up to twice in each calendar year; this restriction does not apply to discounted annual and annual all-line Budapest-passes. In case of passengers with travel documents for free travel, the fee increases to 2,000 HUF after the second occasion. A pass purchased or exchanged after the issuance of a penalty fare is not accepted for presentation, not even if the validity starts on the day of penalty, but the time of purchase is later than the time of fining. A person duly authorised by the customer (e.g. family member, relative or friend) presenting the original authorisation of the official format can also present the pass along with the required original documents. Please keep the payment receipt for the pass presentation fee for 5 years. Please always indicate in the customer data field the name and address of the passenger required to pay the penalty fare. The amount of the penalty fare (16,000 HUF) is pre-filled, but the amount needs to be filled in in multiple fields with words (text) as well. Please complete the cheque with CAPITAL letters. As correcting the cheque is not allowed, in case you make an error while completing the cheque, please pay by bank transfer (see option 5 below) or in person at one of the dedicated BKK customer points listed under the General Information section above. Payment is NOT possible with the Domesctic Postal Order (“pink cheque”). You can also pay by cheque (that was included in the payment notice) at any post office in Hungary within the deadline indicated in the payment notice. 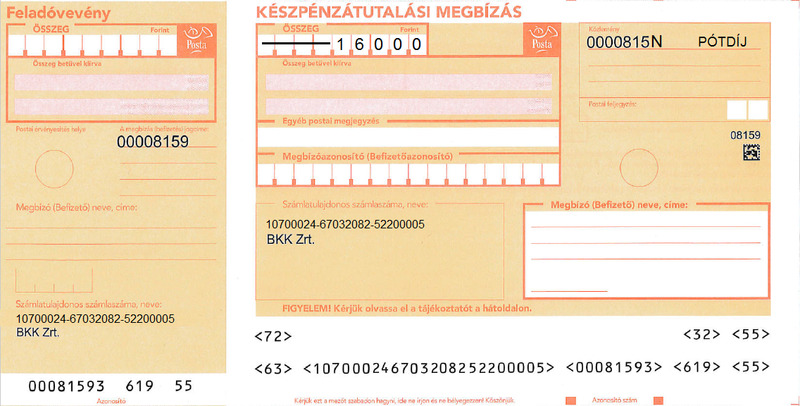 You can pay by cheque at any post office in Hungary according to the agreed instalment payment plan. The amount of the instalment is pre-filled, but the amount needs to be filled in in multiple fields with words (text) as well. Please pay by the deadline. A transfer can be initiated with a paper-based order at the bank or online via internet banking. Please use BKK’s following bank account number: CIB Bank Zrt. 10700024-67032082-52200005. 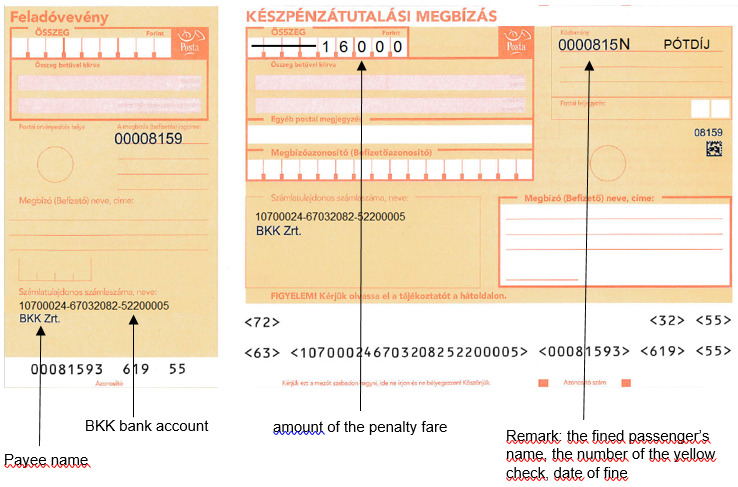 Please indicate in the remark field the name of the passenger paying the penalty fare, the fact that it is a penalty fare (pótdíj) and a reference number (date of issue of penalty fare, correspondence registration number, reference number, order for payment or payment notice number). 5.1 If payment of the 16,000 HUF is made within 30 days after the issuance of the penalty fare, please indicate in the transfer remark field the following data shown on the cheque received from control staff: identification number, date of issue, customer name. 5.2 In case you received a payment notice, a payment order or if you have an instalment plan, please transfer the amount shown therein to the indicated bank account. For the correct accounting of the transferred amount, please indicate in the transfer remark field the name of the passenger who received the penalty fare and the identification number shown in the letter. Paying to accredited partners can be done with a cheque issued by the partner, by bank transfer or cash deposit into the bank account provided by the partner. Method of payment is the same as described under points 4 and 5. Based on the appointment of BKK Zrt., the names and contact details of cooperating partners in penalty fare collection are listed here. If you pay the penalty fare in cash on the spot, the amount decreases from 16,000 HUF to 8,000 HUF. The ticket inspector must give you a receipt for the on-the-spot payment in all cases. Retrospective payment of the on-the-spot penalty fare is possible – cash or bank transfer – within 2 working days after surcharging at one of the dedicated BKK customer points listed under the General Information section above. If the passenger does not pay the fine on the spot, the ticket inspector initiates a penalty fare procedure, offering the option of deferred payment. In this case the inspector is entitled to ask for the required personal data (name, mother’s name, date and place of birth) and also the address of the passenger. On the basis of these data, the ticket inspector fills in a Penalty Fare Report. If the passenger refuses to provide personal data, the ticket inspector is entitled to ask for on-site police assistance. The ticket inspector gives a cheque for the amount of the penalty fare and an information leaflet about payment options. The passenger needs to sign a document of receipt for the penalty fare cheque along with consent to the disclosure of personal data. The refusal by the passenger to sign the document or to accept the cheque means no exemption from the penalty fare procedure. In case the passenger is in possession of a pass and a matching ID (pass ID, student ID, personal photo ID, passport or card-format driving licence) or bicycle pass that was valid at the time of control having been purchased before, but was not presented or if the passenger has a travel document for free travel but it was not presented at control, the customer can settle penalty fare payment within 5 workdays from the issuance of the penalty fare at one of the dedicated BKK customer points listed under the General Information section above by presenting the pass or travel document and paying the appropriate fee. The fee is 1,000 HUF for annual, semester and quarterly passes and travel documents for free travel and 2,000 HUF for all other types of passes. This option is available up to twice in each calendar year; this restriction does not apply to discounted annual and annual Budapest-passes. In case of passengers with travel documents for free travel, the fee increases to 2,000 HUF after the second occasion. A pass purchased after the issuance of a penalty fare is not accepted for presentation not even if the validity starts on the day of penalty, but the purchase time is later than the time of penalty. If the passenger is entitled to free travel according to the applicable Government Regulation, but cannot prove it during ticket control, he or she can present the original documents verifying entitlement at the time of surcharging, within 5 workdays from the issuance of the penalty fare at one of the dedicated BKK customer points listed under the General Information section above. In this case, the penalty process will be canceled for a procedure fee. The procedure fee in each calendar year for the first two times is 1,000 HUF and 2,000 HUF for any further cases. If the ticket inspector keeps the pass/pass ID after control, the option of later presentation is not available. The passenger who does not pay the penalty fare of 16,000 HUF within 30 days is obliged to pay an additional 16,000 HUF as a late payment fee and an administration fee of 500 HUF, i.e. a total of 32,500 HUF. If this amount is not paid either, BKK Zrt. will initiate an order for payment. If the order for payment is contested, the procedure will be turned into a lawsuit. Based on the final order for payment or the final court ruling resulting in the passenger’s conviction, BKK Zrt. may initiate an enforcement procedure as well. BKK Zrt. is entitled to involve a third party in the management and collection of penalty fare claims to act instead and on behalf of BKK Zrt. BKK Zrt. reserves the right to assign its valid claims to a third party based on Articles 328-330 of the Hungarian Civil Code. The passenger gives his or her consent to BKK Zrt. to transfer the managed passenger data to a third party in the event that BKK Zrt. involves or assigns a third party in debt management and collection. BKK Zrt. is entitled to charge, in addition to the penalty fare amount, all costs incurred in connection with the debt collection process (administration fee, lawyer’s fee, cost of postage and interest up to the day of payment) to the passenger. Why should I pay when I present a valid pass with a matching ID card? For using our services, buying a pass is not sufficient: during control, it must be presented and handed over to the control staff along with the matching photo ID, such as a pass ID, student ID, personal ID card, passport or card-format driving licence. In case you were not able to show your pass and the matching ID to our colleague, the penalty fare is legitimate. However, customers can also pay the penalty fare within 5 workdays from issue at one of the dedicated BKK customer points listed under the General Information section above by presenting the pass or travel document along with the matching ID and by paying the appropriate fee. The payment of the administrative fee is mandatory as the penalty fare process generates expenses for our company. What should I do if my documents have been stolen (lost) and/or my data are being abused? In light of the circumstances of your penalty fare issuance, we may also suggest you contact the police on account of the abuse of personal data and/or personal documents and then send the copy of the notification/report to our company (by post to BKK Zrt. 1241 Budapest, Pf. 200., or via e-mail to [email protected] ). In case of penalty fare for an underage child, will the parent receive the formal notice? From our point of view, if an underage child is already allowed to use our Company’s services independently based on the decision of the legal representative, then in case of violating the travel terms, the child can also receive penalty fare as well. Our Company assumes the relationship of trust between parent and child, so if a penalty fare has been issued, then the underage will inform his or her legal representative about the resulting payment obligations and will hand over the informational leaflet about the responsibilities and options of paying the penalty fare along with the payment slip (cheque), thus enhancing the timely payment of the penalty fare at a lower cost. During the penalty fare process, the inspector can only register the child’s data because he or she is the passenger receiving the penalty fare. In addition, the underaged passenger has no document that can verify the exact name and address of the legal representative. Accordingly, we can send the formal payment notice only to the legal representative of the underaged child. Payment notices will be sent to the legal representative after the 30-day-period available for paying the basic penalty fare, but at that point the notice will show an increased amount including the penalty fare, the late payment and procedure fees.